Transportation Performance Management (TPM) is a strategic approach that uses system information to make investment and policy decisions to achieve performance goals. An increasing number of transportation agencies are adopting TPM principles to ensure the right bundle of projects is selected and delivered to produce the performance outcomes desired by the agency, external partners, elected officials, and the public. TPM helps determine what results are to be pursued, using information from past performance levels and forecasted conditions to guide investments, measuring progress toward strategic goals, and making adjustments to improve performance. TPM is grounded in sound data management, usability, and analysis as well as in effective communication and collaboration with internal and external stakeholders. The key to successful implementation of TPM practices lies in the organizational support and agency embrace of data-driven decision making. Creation of Unifying Focus for Agency: Carefully considered and connected goals, objectives and measures become the structure upon which an agency’s transportation performance management approach rests. Clearly communicating “where do we want to go” builds staff support for the agency’s purpose and provides a unifying direction for day-to-day activities. Additionally, articulating longer term outcomes for an agency and determining how progress will be evaluated not only helps clarify what the public and other stakeholders expect from the agency, but also links transportation investments to what the public cares about. Prioritization of Investments Based on Performance Needs: Information on past performance and expected future conditions enables agencies to guide resources to areas most in need of attention, thus using resources most effectively. Data highlight areas of lagging performance, enabling prioritization of projects to address such lags. By making decisions to improve how the transportation system functions, agencies engaged in TPM can minimize life-cycle costs of assets. Linking Funding Requests to System Performance: Performance data can indicate the effect of declining or increasing funding levels on performance of the transportation system; by making the case to policymakers using data, agencies can and have been successful in obtaining increased funding. Communication of the Benefits from Transportation Investments: Through engagement with the public and other stakeholders, agencies clearly understand what performance outcomes are desired. Performance data enables agencies to inform external stakeholders on the results of investment decisions. Fulfillment of Legislative Requirements: The Moving Ahead for Progress in the 21st Century (MAP-21) Act1 and the subsequent Fixing America’s Surface Transportation (FAST) Act2 put greater emphasis on TPM by requiring use of such practices in statewide, metropolitan, and non-metropolitan transportation planning. Although this guidebook does not serve as official guidance on the implementation of federal legislation, employing TPM practices will assist with implementing TPM-related regulatory requirements. Monitoring and Adjustment (Component 05) emphasizes that what agencies do with performance information distinguishes transportation performance management from performance measurement. Under a traditional transportation performance measurement framework, an agency sets a strategic direction, defines measures, and tracks results without a strong feedback loop that adjusts programming mid-stream. The evolution of transportation performance management urges agencies to actively use information gained from monitoring performance data to obtain key insights into the effectiveness of decisions and identify where adjustments in programming need to be made. The combination of monitoring and adjustment processes is the “bread and butter” of advanced TPM practices, establishing a critical feedback loop between performance results and future planning, programming and target setting decisions. The TPM Framework also emphasizes the importance of Organization and Culture, External Collaboration and Coordination, Data Management, and Data Usability and Analysis. Organization and Culture (Component A) is depicted as a circle surrounding all other components within the Framework because the organization and culture of an agency impacts all other processes that are undertaken. Without a supportive agency culture, TPM processes will be difficult to implement and will likely fail to be sustainable. A focus on building leadership team support, clarifying TPM roles and responsibilities, integrating TPM into management practices and providing workforce training are important to the successful implementation of TPM. The External Collaboration and Coordination (Component B) element seeks to emphasize how external partnerships and involvement are interwoven throughout TPM practices, including planning, programming, monitoring, and reporting. It is important to note that within each of the components, internal collaboration is stressed as a fundamental element. Two components concerning data, Data Management (Component C) and Data Usability and Analysis (Component D), emphasize how essential data is to transportation performance management. Data are the foundation of TPM, and these two components will assist agencies in developing their data for use in activities throughout the other components. Definitions for each component are provided below; subcomponent definitions are contained in guidebook chapters. Definition: The establishment of an agency’s focus through well-defined goals and objectives, enabling assessment of the agency’s progress toward meeting goals and objectives by specifying a set of aligned performance measures. 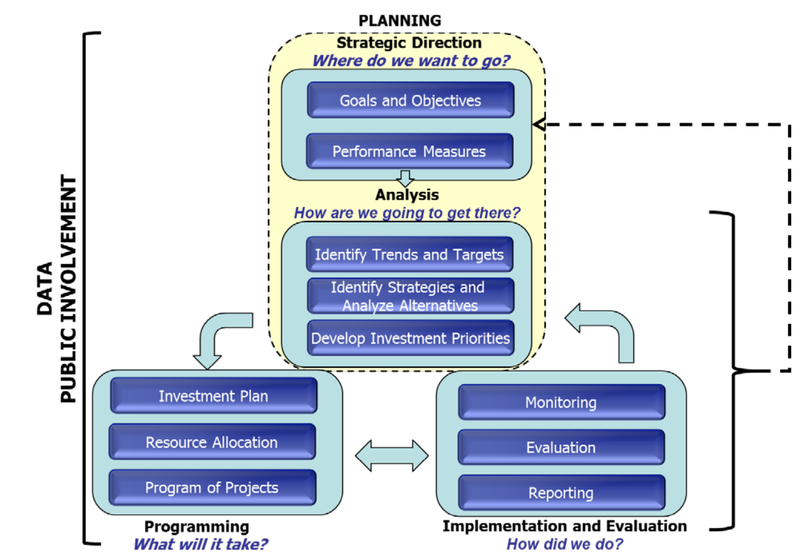 The Strategic Direction is the foundation upon which all transportation performance management rests. Definition: The use of baseline data, information on possible strategies, resource constraints, and forecasting tools to collaboratively establish a quantifiable level of performance the agency wants to achieve within a specific time frame. Targets make the link between investment decisions and performance expectations transparent across all stakeholders. Definition: The use of agency goals and objectives and performance trends to drive the development of strategies and priorities in the long-range transportation plan and other performance-based plans and processes. The resulting planning documents become the blueprint for how an agency intends to achieve its desired performance outcomes. Definition: The use of strategies and priorities to guide the allocation of resources to projects that are selected to achieve goals, objectives, and targets. Performance-based programming establishes clear linkages between investments made and expected performance outputs and outcomes. Definition: A set of processes used to track and evaluate actions taken and outcomes achieved, thereby establishing a feedback loop to refine planning, programming, and target setting decisions. It involves using performance data to obtain key insights into the effectiveness of decisions and identifying where adjustments need to be made in order to improve performance. Definition: The products, techniques, and processes used to communicate performance information to different audiences for maximum impact. Reporting is an important element for increasing accountability and transparency to external stakeholders and for explaining internally how transportation performance management is driving a data-driven approach to decision making. Definition: Institutionalization of a transportation performance management culture within the organization, as evidenced by leadership support, employee buy-in, and embedded organizational structures and processes that support transportation performance management. Definition: Established processes to collaborate and coordinate with agency partners and stakeholders on planning/visioning, target setting, programming, data sharing, and reporting. External collaboration allows agencies to leverage partner resources and capabilities, as well as increase understanding of how activities impact and are impacted by external factors. Definition: A set of coordinated activities for maximizing the value of data to an organization. It includes data collection, creation, processing, storage, backup, organization, documentation, protection, integration, dissemination, archiving, and disposal. Well-managed data are essential for a robust TPM practice. Definition: Existence of useful and valuable data sets and analysis capabilities available in accessible, convenient forms to support transportation performance management. While many agencies have a wealth of data, such data are often disorganized, or cannot be analyzed effectively to produce useful information to support target setting, decision making, monitoring, or other TPM practices. The focus of this guidebook is to move the theory of TPM into practice by providing “how-to” information for agencies interested in implementing or improving the application of TPM principles. For each TPM Framework component, the guidebook describes the component’s key concepts, highlights the interrelationships between the other nine components, defines associated terminology, and presents a customizable action plan worksheet. However, the majority of the guidebook outlines concrete steps agencies can take to establish or enhance their TPM approach. To further the exchange of noteworthy practices and assist agencies with implementation, each step is augmented by examples and practitioner quotes from around the country. This guidebook is tailored to transportation agencies interested in implementing or enhancing TPM practices, including State DOTs, MPOs, and transit agencies. As much as possible, jargon and overly technical terms are avoided to make the guidebook more accessible to staff at all levels and in all divisions within an agency. For the sake of brevity, not all background information and TPM research is included. Instead, a select list of resources that provide additional details on TPM (e.g., FHWA’s Performance-Based Planning and Programming Guidebook6) is included in each chapter. The Guidebook is not intended to establish requirements or standardize practices that must be used by all agencies and does not serve as official guidance on implementation of federal legislation. However, given the role MAP-21 Act and the subsequent FAST Act7 are having in the establishment of TPM as a sound business practice, each guidebook chapter includes links to legislative and regulatory resources. Finally, the guidebook emphasizes that the implementation of TPM practices will not be a one-off activity. Implementation will be step-wise and gradual, with continuous improvement over time. It is recommended that all Guidebook users first review the summary fact sheets for each of the ten TPM components and for the overall guidebook. These condensed versions of the guidebook chapters provide a comprehensive view of TPM principles and may be useful as staff attempt to build support or educate their peers about particular aspects of TPM. These fact sheets will also help identify which TPM component guidebook users would like to further explore. Overall, the guidebook is designed to be modular as much as practicable to enable users to zero in on a particular aspect of transportation performance management. The guidebook is not intended to be read from front to back. Instead, it provides actionable information that can be easily identified and implemented by agencies. Although each Guidebook chapter is a stand-alone resource, the linkage between the various TPM components and subcomponents are continually highlighted. TPM, by its very nature, is an integrated process, as demonstrated in Figure Intro-1. TPM Framework: Graphical representation of the ten TPM components and their subcomponents, as well as the relationships between components. TPM Capability Maturity Self-Assessment: Interactive method to determine an agency’s level of maturity and action items to improve TPM practices (using the capability maturity model described below). Practitioner Consortium: Searchable database of agency staff nationwide who may serve as a resource for other agencies or as subject matter experts at TPM events. Guidebook: How-to guide for implementing TPM practices, as described here. Resources: Library of relevant TPM resources that will further assist those interested in expanding and/or improving TPM practices at an agency. Guidebook users are encouraged to utilize these resources and visit the TPM Toolbox website often to access additional information. In 1991, the Carnegie Mellon Software Engineering Institute (SEI) published a capability maturity model (CMM) to provide the federal government with a method for assessing the capability of its software contractors. The CMM for software proved to be very successful and achieved a high level of adoption. The maturity model concept has been adapted for a wide variety of process and domain areas. Maturity models have proved to be a useful framework that can be applied in order to assess an organization’s current state, identify a logical set of improvements, and show the benefit of moving to higher capability levels. Based upon extensive review of transportation and non-transportation related capability maturity models and the existing resources on TPM practices, the TPM Capability Maturity Model was created. The primary objective of the TPM CMM is to provide maturity level descriptions for the TPM components that transportation agencies could begin using to evaluate their TPM capabilities, and identify areas where the agencies should take steps to improve these capabilities. The TPM CMM maturity level descriptions for each component are available on the TPM Toolbox website and reflect the general descriptions contained in Table Intro-1. 1- Initial Transportation performance management processes are generally champion-driven, ad-hoc, uncoordinated, and reactive in nature. Success may result from heroic activities on the part of champions rather than from established agency processes and culture. Performance measures may exist to meet reporting requirements but are primarily driven by what data are available rather than by providing meaningful and actionable indicators of progress. There is little alignment across different performance-based plans, and between planning and programming. Collaboration is reactive rather than proactive. 2- Developing Work is underway to strengthen transportation performance management in the agency. A transportation performance management framework is being defined to provide alignment across the organization and across different planning and programming functions. Modifications to data collection and management processes and analysis tools are being planned in order to better support the performance framework. Organizational roles are being defined, and a strategy for training and workforce development in support of transportation performance management is being developed. 3- Defined The agency has a well-defined and documented framework of goals, objectives, and performance measures. Roles and responsibilities for transportation performance management have been defined, but not yet fully implemented. Data are available to support measure calculation. An approach to target setting has been defined based on use of baseline and trend data. Analysis tools and data reporting systems are in place, but have not yet gone through a “shakeout” period to ensure that they fully meet the needs. 4- Functioning Transportation performance management practices have been institutionalized. Staff at multiple levels of the organization understand their roles with respect to achievement of performance targets and are held accountable. Performance reporting processes are well-established and available systems are functioning as intended. Information provided is used to inform actions and pursue course corrections. 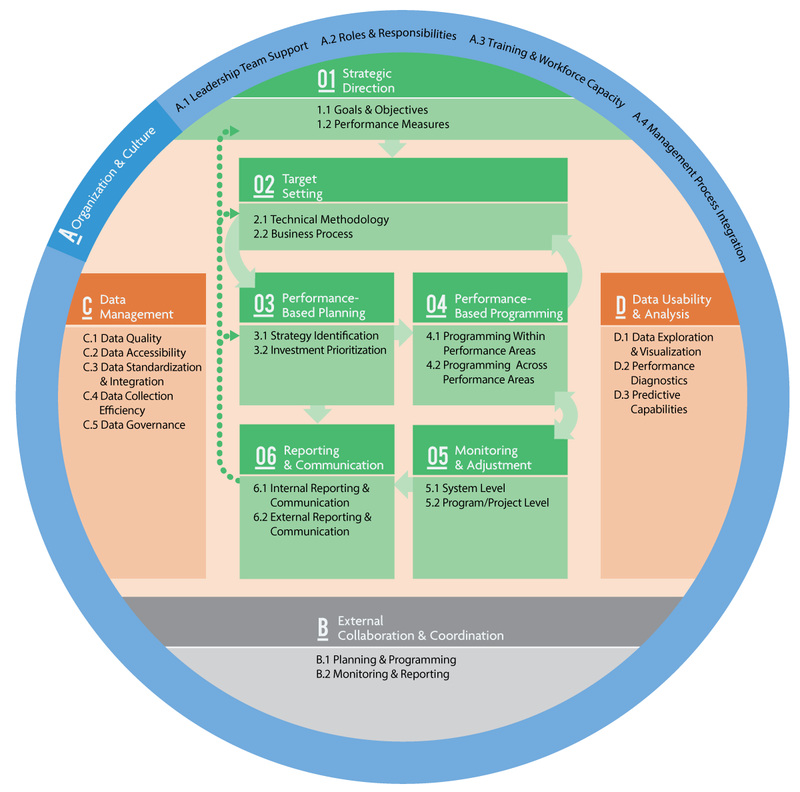 There is alignment across planning partners on performance measures, benchmarks, and targets. Performance data may still have gaps and quality issues, but processes are in place to improve these over time. Basic predictive capabilities are in place for future performance projections and are starting to be applied. Resource allocation processes are data-driven within performance areas. The agency is able to analyze tradeoffs across selected performance areas, though resource allocation may not be based on these tradeoffs. Data are being gathered to evaluate the costs and effectiveness of actions taken. Communication of performance results is being pursued in a deliberate and strategic manner, with different levels and formats of information designed to meet the needs of different internal and external audiences. 5- Sustained Transportation performance management is ingrained in the agency culture to a point where it would be expected to be sustained across changes in leadership. Managers at multiple levels of the agency depend on performance data for planning, budgeting, needs assessment, and prioritization activities. A solid base of evaluation information is available to allow for project/action selection and prioritization based on an understanding of cost-effectiveness. Performance data are generally considered to be credible and reliable. Data quality and availability are regularly assessed and improved. Performance results made available to external agency stakeholders are positively received and are strengthening agency credibility, helping to make the case for required resources. The TPM Capability Maturity Self-Assessment provides an evaluation of an agency’s TPM practices as a whole and for each TPM component based on a 1-5 scale similar to Table Intro-1. In addition, the assessment refers to sections of the guidebook which will be useful for moving the agency to the next maturity level. Because State DOTs may have more advanced performance capabilities in selected areas (e.g., safety or pavement management), the assessment tool allows for assessments to be conducted for individual performance areas. FHWA Fact Sheets on Moving Ahead for Progress in the 21st Century (MAP-21). FHWA Fact Sheets on Fixing America’s Surface Transportation (FAST) Act. Performance Based Planning and Programming Guidebook. Washington, DC. 2013.